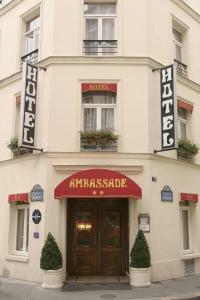 Ambassade, Paris discount hotels and accommodation. Entirely air-conditionned the hotel Ambassade, located between the Place de lEtoile and the Eiffel Tower, just a step from Champs-Elysées, propose you 38 personalized and felted rooms, ambassadresses of the good French taste. You will find the comfort wished in a well-kept frame. The buffet breakfast will be served to you in a basement room, typically Parisian. Within walking distance of some of Paris' most popular attractions, please, take advantage of the tranquillity of this residential area. View photos, room descriptions and make online reservations at Ambassade. Save on room prices at Ambassade, Paris.